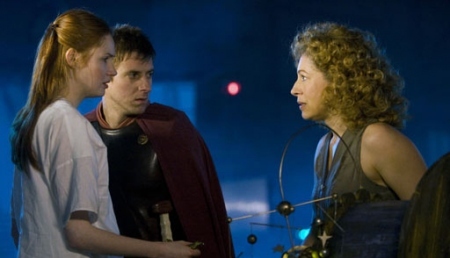 Karen Gillan, Arthur Darvill and Alex Kingston in "A Good Man Goes To War." Photo courtesy of topuspost.com. The first half of Doctor Who's sixth series came to an end with "A Good Man Goes To War" on Saturday. (Warning: This episode has not yet aired in the U.S. If you haven't seen "A Good Man Goes To War," stop reading now, because there are major SPOILERS ahead.) Since the show won't be back until the fall, I thought now would be a good time to discuss what has happened so far, and to predict what might come to pass when the show returns. I'll get to the serious OMG-moments later in this post, but I first want to note that this is one of the most consistent runs of Doctor Who I have ever seen. This show can be remarkably inconsistent - for every "Human Nature" and "The Family of Blood" or "The Girl in the Fireplace," there is a "Daleks in Manhattan" or "Fear Her" - but the first seven episodes of the sixth series have all been remarkable in their consistency. The weakest episode was probably "The Curse of the Black Spot," but even the pirate-centric episode was entertaining (unlike "Fear Her"), and the pirates even made a return appearance in "A Good Man Goes To War." While there were no truly bad episodes in the first half of the season, these episodes also featured one of the my new favorite episodes of the series as a whole. "The Doctor's Wife" ranks with the aforementioned "Human Nature" and "The Family of Blood" and "The Girl in the Fireplace," as well as the other excellent episodes "Blink" and "Vincent and the Doctor," as one of the top episodes of the rebooted series' run. Even if the other episodes had been terrible, I would have loved the season purely for the inclusion of "The Doctor's Wife;" as it was, it has been a great seven episodes, with that most excellent episode as a true standout in a series of solidly good-to-great hours. Another excellent feature of these seven episodes has been the way that the season's major storyline has been prominently featured. Often in Doctor Who, the big story has been teased only intermittently throughout the season, and then come to play an important role in the final two or three episodes. (This is especially the case in Series Three, with the appearance of the Master, and Series Four, where the excellent Doctor-Donna revelation was barely brought up in the season's earlier episodes.) It's only Episode Seven, and many hints - the appearance of the Flesh and the creepy woman with the eye patch as two examples - have already been integrated into the major story. It was clear as early as the first trailer for the season that Alex Kingston's River Song would play an important role in the season, and the seventh episode brought her character into the story in a big way. (Seriously, if you haven't seen "A Good Man Goes To War," stop reading NOW.) I still don't know how I feel about River Song being Amy and Rory's daughter, Melody Pond, largely because it makes her (apparently romantic) relationship with the Doctor seem a little creepy. However, I can't deny that the revelation seriously complicates the storyline as we know it so far. I'm a little worried, though, that this twist will take away from the suspense of the series. After all, we now know that little Melody will be safe, and will ultimately be protected by the Doctor, which makes the quest for her recovery less of an issue. Since it appears that finding Melody will make up the bulk of the second half of the season - which it might not, because what do I know? - it lessens the dramatic tension quite a bit to know that she will ultimately be alright. I said before that the knowledge of River's true identity makes her relationship with the Doctor... strange, to say the least. However, there is dramatic potential here. Throughout the rebooted series, we've seen the Doctor's (mostly female) companions develop a romantic attachment to him, an idea that has been explored even more potently with Karen Gillan's Amy, who met the Doctor as a child and became extremely attached. Now, Amy has moved on and is happy with Rory, but another example was forthcoming in "A Good Man Goes To War:" Lorna Bucket, the young Cleric who joined the military purely to find the Doctor, having met him once as a child. Her story is similar to that of the individuals in the Series Two episode "Love and Monsters" - the people who aren't privileged enough to become companions, those who are touched by the Doctor and then spend their lives trying to regain the magic. The notion of the way the Doctor draws people to him, sometimes to an unhealthy extent, is one that is ripe with potential. This is the facet of the Doctor's relationship with River that could blossom into something really interesting. There are a lot of interesting plot threads leading into the second half of the season. The use of the Flesh, for one, holds a lot of promise, as its existence has already proved critical for several plot devices. I'm also looking forward to the reemergence of the angry Doctor, the terrifying man whose name, in the language of Lorna's people, has come to mean "great warrior," the man who can summon an army at the mere mention of his name. The tension between who the Doctor is and what he has done has always been an excellent source of dramatic tension for the series, the knowledge that the man who never carries a weapon was responsible for the destruction of two species and countless other deaths. Davros used this contradiction to mock the Doctor in "Journey's End," and it was flung in his face again by Madame Kovarian in "A Good Man Goes To War." Watching the Doctor reconcile the two halves of himself - the one that strives for peace, and the one born in blood - has made for some compelling television in the past. I have no doubt that the second half of this season will be even more compelling, and that River Song and Melody Pond will play an important role in allowing the Doctor to embrace the mess of contradictions that makes up his self.